While recuperating I decided to do a couple of little projects. Mind you I've had this tray for years just hanging out in my crafts closet. Since I wasn't up to big things I decided to tackle something small. I love trays for some reason. I have a collection of silver plate trays, but I've always liked these wooden ones too. I am smitten with images using bees and when I saw a great bee graphic from The Graphics Fairy I knew I wanted to add it to my tray. I started with a basic tray from the craft store. I sanded it and gave it a coat of a half gesso and half paint mix, the paint is Sharkey Gray. After that coat dried I added a wash of Magnetite and water and wiped some off to expose the Sharkey Gray, after that I added a 50/50 wash of Glass Of Milk and water and wiped off the desired amount. I transferred the printed image to the tray using Matte Gel Medium. After letting the paint dry for 24 hours cut out your graphic as close to the image as possible, then apply the Matte Gel Medium to the image in a smooth light coat. This part is a little tricky because you don't want too much or too little. After you smear the medium onto the image, I use my finger but you can use a brush if you'd like, press the image printed side down, get it centered and even then burnish the image with the back of a spoon in a circular motion, not hard enough to rip the paper but firmly enough to transfer the image. Lift up a corner and peek to see if the image is transferring. If it has, at this point you can lift the paper off or you can let it dry completely. I chose the latter. If you let it dry you will have to dampen your finger and rub the paper,when you can see the image through the paper start rubbing the paper away in a circular motion, don't rub to hard and do small sections at a time. This part can be a little tedious. After the image was transferred I applied a second coat of the Glass of Milk wash and wiped off the desired amount. After all was done I gave it a couple of light coats of wipe on poly in satin. Here is the finished tray. Its So Very Cheri for Party Time Between Naps On The Porch for Met. Monday and The Graphics Fairy for Brag Monday and Chocolate Drool And Kisses for Sharing Monday and Bunny Jeans Decor and More for Bunny Hop Wednesday and Funky Junk Interiors for SNS. Kreative Korner for Tea Time Thursday and The 36th Avenue for Share Awesomeness Thursday and The Lettered Cottage For How To's Day. I love bees too and your tray is adorable!! I'm your newest follower!! Stop over for a visit! Lovely makeover. Don't you just the The Graphic Fairy? what a lovely job you did on this. We all love the Graphic Fairy!!! love it! I really like the bee tray! :D *awesome* job!!! I love to collect trays too. Love your bee idea very cute! Oh My Goodness! I love this tray soooo much. Can't wait to copy (I mean try) it! Super, SUPER cute, Karen! Great job on your tray! i love the finish you gave it. OK I have to go and try this now...I love it and you've done a great job! I actually have a tray I can try this with, mind if I borrow the idea? Thank you so much for your sweet comment about my screened in sun-room that Susan featured today for her Metamorphosis Monday and yes it really was only $99.00! My only regret is I wish I had picked up another one at that price since it has come in so handy this summer! We've enjoyed our little room so much this summer minus the bugs and the baking sun! Plus I can go in and change it up every once in a while to suite my mood and or season! This is beautiful, Karen! I just saved this image myself and can't wait to find something to use it on! Love the color you chose for the tray, too! Great transformation. I've been wanting to try the gel medium. Thanks for your sweet comment on my frenchy chairs. Swoon!!! This is too fabulous! Great job, this is truly one of the prettiest trays that I've ever seen. So nice that you shared your techniques too! I love it that you've made it a smoky grey - it looks fabulous! I rather like that crack too. It makes the whole weathered look come together beautifully. That's a great graphic that you've chosen to use. I love it!! It looks so pretty! Excellent work! Karen, that tray is so lovely! Thank you so much for visiting my blog. I noticed your next post with thrifty finds and would love to have you join my first thrifty hop this Thursday! Have a great week and glad you're feeling better! Your tray is fabulous! I just saved that image too but I haven't figured out what to do with it yet. This is food for thought! The tray turned out beautifully Karen. A little extra character never hurts. Fabulous tray. Now come on, you put the crack in on purpose! How'd you get such perfection? Love it! Wow, what a wonderful transformation! I am off to check out your other goodies! I have trays just laying around the house that could benifit by this treatment. Your's turned out great. 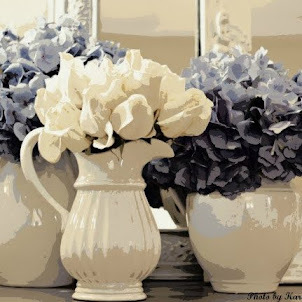 xoxo BunnyJean @ BunnyJean's Decor and More! VERY sweet makeover- just the graphic it needed :) I'm a big fan of The Graphic Fairy's too- Karen is a treasure! Saw you featured over at Karen's Graphics Fairy today. Stellar tray! Just beautiful! I love that image and you did a great tutorial on this - thanks! Oh, what a wonderful idea! That looks great - I'm very excited!I've found on a German blog to you and look at me a little about you. I love it! I'm not familiar with the wash of Glass Of Milk and water. Could you please elaborate? Saw you wonderful tray on the Graphics Fairy. Thanks for sharing your techniques. What brand of paint did you use? Love Sharkey Gray. The tray looks beautiful esp with the shells and star fishes. The design is so neatly done. We have a link up party going on - Tea Time Thursdays @ Kreative Korner. Would be glad to see some of your awesome posts there. Hope to see you at the party. Love what you did to the tray! And you have a neat rooster collection in the most recent post! What an amazing transformation, just beautiful!